Last Thursday night Jungle played host to it's first ever Rum Tease - a burlesque night with a tropical tiki twist. 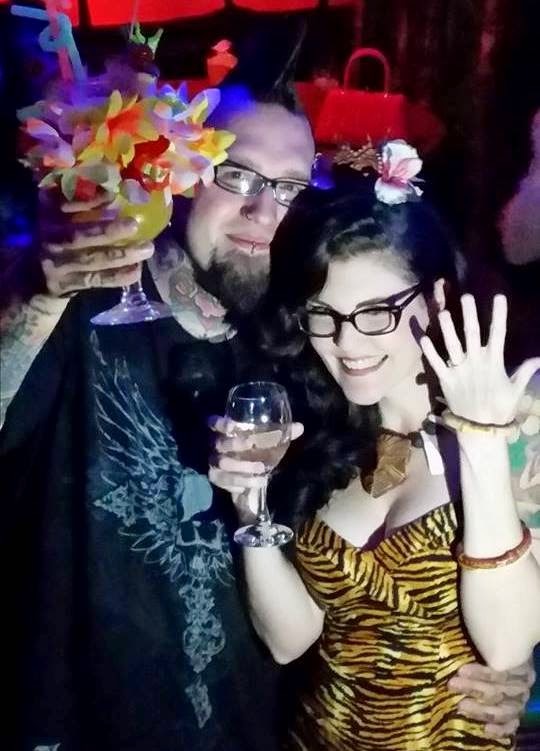 I was lucky enough to be invited along and I couldn't wait to get back into some of Jungle's tasty cocktails. Being a Thursday night the bar wasn't as packed as a weekend, which was good because it offered the perfect, intimate atmosphere for a night of hip-shakin wahines. With performances by Miss BB Le Buff and Frankie Mae Felon, the cocktail menu featured a refreshing summer-inspired cocktail in honour of both ladies. The 'BB Le Buff' was a delicious tiki take on a summer slushy that featured fresh blue berries and was as creamy as the skin of the lovely lady herself. The 'Frankie Mae' proved that good things come in small packages or in this case, glasses, with a sweet yet punchy passion fruit flavour. As usual, the bar was spinning great tunes in between acts, playing everything from traditional Hawaiian sounds to psychedelic surf, rockabilly and even some classic 50s hits thrown in to the mix. The crowd was welcoming, with strangers quickly becoming friends and I managed to enjoy the company of some friends both new and old. It was the perfect prelude to the weekend, and that was even before the burlesque started! But onto that, the performances began with Miss BB Le Buff where things got a little weird, in the best possible way. Bumping and grinding her way from restless native to flower bedecked honey, Ms Buff got the night off to a cheeky start. Getting her tiki torch on, Miss Frankie Mae Felon wrapped things up with an enchanting act that incorporated fire breathing! Draped in thin cloth and with a midriff that set the room on fire, Ms Felon gave us what we wanted, but left us wanting more. That's where I stand on the new Rum Tease nights at Jungle. Wanting more. It's the perfect way to get your weekend started a little early and is lots of fun, whether you're drinking or driving. I managed to enjoy a couple of excellent cocktails despite the fact I had to drive but I urge you to find a Designated Dave if you can, the cocktails at Jungle are simply too good to deny. 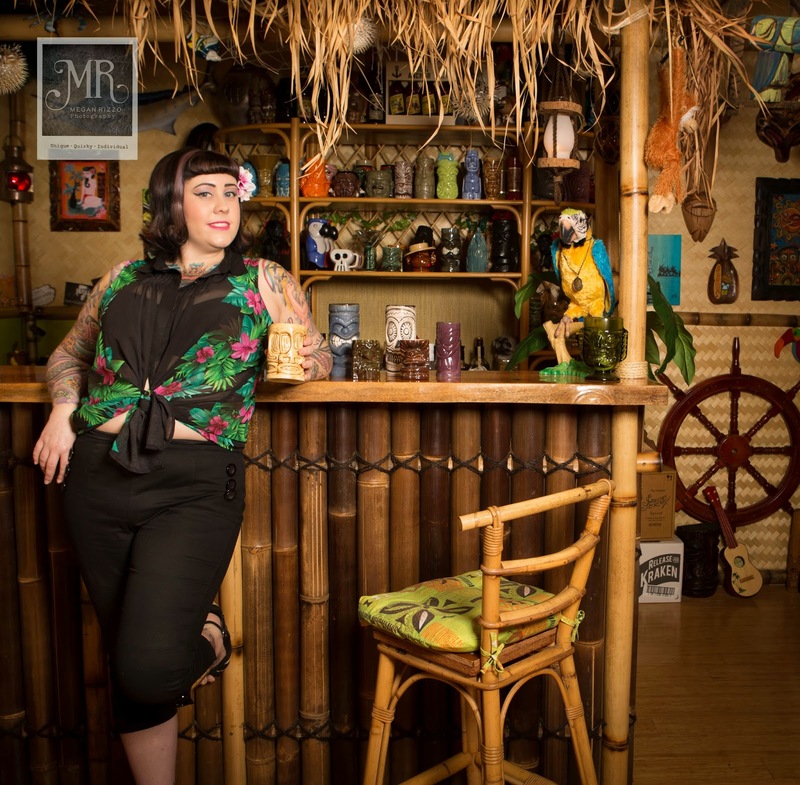 Great for a girls night out, a fun date night alternative or just to get the gang together, Jungle's new Rum Tease events are a tantalising way to spend your Thursday night and I for one can't wait until the next one! I'll be sure to keep you updated on any future Rum Tease events. Better yet, why not like them on Facebook and keep track for yourself? Aside from Rum Tease, they host a number of other regular events like Tiki Halloween this Friday! Unfortunately I can't make it so you'll just have to tell me how much fun it was! I'll see you next time at the bar! 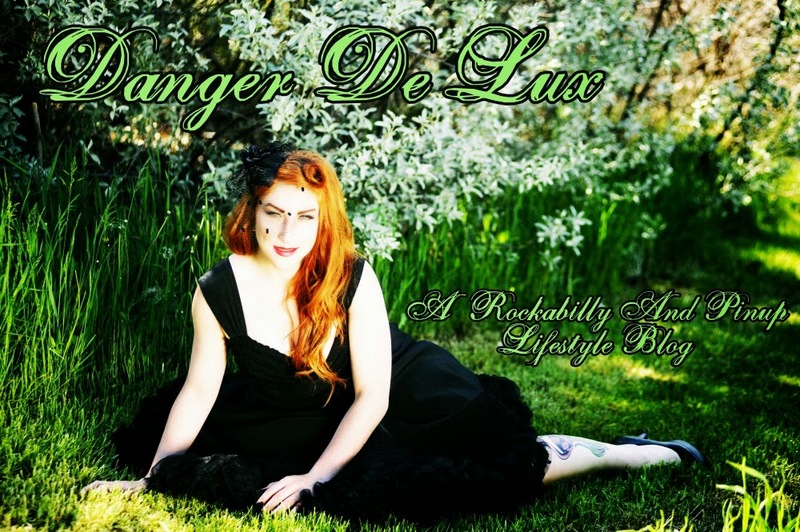 Today I'm being featured over at Danger DeLux talking about what's in my make up bag. 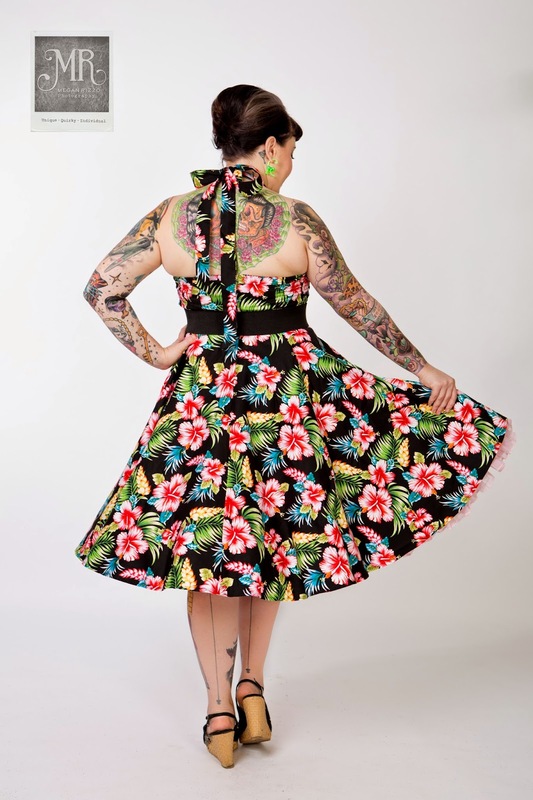 Natasha is the brains and beauty behind this Canadian Rockabilly and Pin Up Lifestyle blog. I've been following her blog since it's very early days and it's been such a pleasure to see her grow and evolve into the classy little space on the interwebs that she's carved out for herself. She's a total go getter and I find her drive and motivation really inspiring. She also owns a gorgeous little French Bulldog called Cherry and I love seeing all the beautiful pictures of the two of them together. The make up bag feature is such a great idea! I'd been mulling over doing something similar on my blog here when Natasha got in contact with me to ask if she could feature me - talk about WIN WIN! I put a lot of thought into it though, so I think I might have gone on a bit. Oh well, I wanted to give plenty of info on the products I use, I always find that type of thing handy when I'm looking at buying new cosmetics. Well hey there and welcome back! It's been a while since I've been round these parts and even though I had a fantastic time on my USA holiday it feels good to be back here. I've missed you guys! 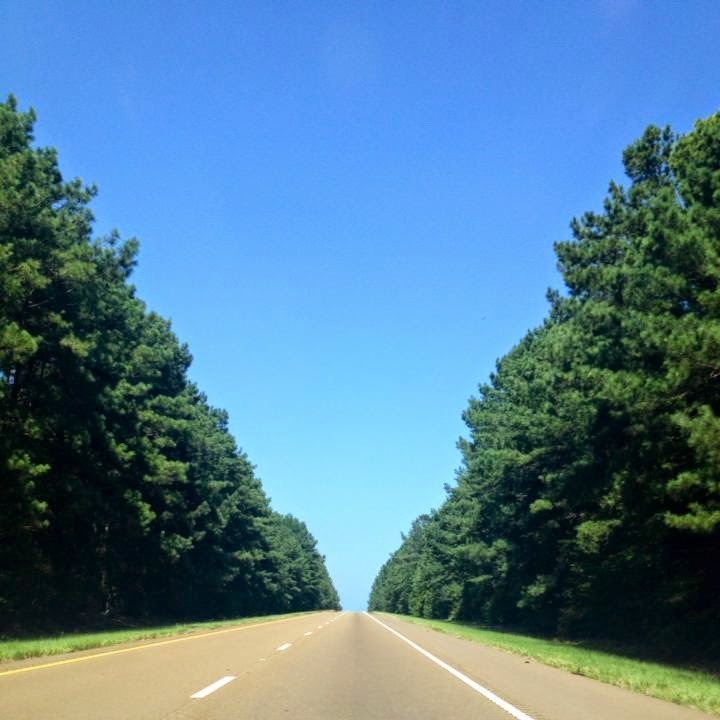 I have to admit I was a bit slack when it came to posting pics from the road, well at least to my blog page and Instagram, although my personal Facebook page was inundated with pics so I've got plenty of fun stuff to share with you guys! I figure we covered so much ground while we were over there that it'll be easiest to break it down into little bite-sized chunks for each place we visited. So away we go! We arrived in Vegas a little worse for wear after the long flight but we were straight into it, catching up with our friends Matt & Elisa at Frankie's Tiki Room on the first night. We spent most of our days doing the tourist thing and checking out all the amazing casinos. On the second night we caught up with Buddy Holiday, our tattooist from last year, who took us cruising in his Mercury to a secluded but awesome BBQ joint for a delicious dinner before heading once again to Frankie's where way too many tiki cocktails were consumed! We finished up our last night in Vegas with a definite highlight, the High Roller. The newest attraction in Vegas, this huge observation wheel is the tallest in the world at 550 feet and at night, the views are absolutely spectacular! The next day we headed to Palm Springs which was HOT! It was 109F when we arrived which is about 45C. Phew! Still, it was the perfect weather for this desert oasis and we filled our days here shopping, relaxing and with a little bit of sightseeing. We got to check out the new Tonga Hut that has recently opened up here and while it's not the most 'decorated' tiki bar I've seen it certainly offers great food, great atmosphere and most of all, great drinks! We were even lucky enough to be able to dine in the secret room, which you have to enter through a hidden telephone box - super cool! However the highlight in Palm Springs had to be the Elvis Honeymoon House. THE house where Elvis and Priscilla honeymooned and indeed intended to be married, the house is in great condition and is an absolute treat for Elvis fans and Mid Mod lovers. It was AMAZING! Definitely my favourite thing about Palm Springs! After a little rest in Palm Springs it was time to hit the craziness of Tiki Oasis! It was an amazing weekend filled with so much fun, shopping, gorgeous people and, of course, partying and drinking! The effort some people go to decking out their rooms for the room parties is phenomenal. The symposiums were fun, especially the one by Skipper Josh from Melbourne's The LuWow and the amazing Charles Phoenix - gosh I love that man! I do think I would be a little more selective about which symposiums I did next time, I tired myself out trying to get to them all. It was also really great to catch up with Aussie and US friends I'd connected with on Facebook for so long and finally meet them in real life. However one of the real highlights for me was buying the original line drawing of a Derek Yaniger piece that a number of my friends told me looked just like me. I got to meet Derek and he even personally signed the piece for me - he flipped out at how much it looked like me! He was such a great guy! Memphis was a bit of a flying visit, we only spent 2 nights here but there's no doubt we'll be back. We kicked things off with an amazing meal at the best and oldest BBQ joint in Memphis where we had some amazing ribs and spent the rest of the night checking out Beale Street. The next day we visited Graceland and Sun Records. Although not quite as big as you imagine, Graceland was amazing. It felt surreal to be there and I couldn't help but tear up when we got to the memorial garden and Elvis' grave. Sun Records was also awesome and our tour guide was really fun. It was so cool to see such an important part of music history and the atmosphere really made you appreciate the big things that happened in that famous little studio. We spent 4 nights in Nashville and although we arrived on a Sunday the town was still rockin! It was a case of another of those 'we'll just have an early night' famous last words that saw us partying up in the Legends Bar until 3am. Damn that town rocks! Aside from shopping for cowboy boots and trying some down home cooking, we also visited the Country Music Hall of Fame, Grand Ole Oprey and the new Johnny Cash Museum. The Hall of Fame is absolutely phenomenal and although we did it in one day, you could easily spend 2 days in their soaking up all that amazing music history. If you're like me and music really speaks to your soul, prepare to get a little emotional. Originally we were just going to take the Oprey tour and skip the show but come on, if you're there you HAVE to see a show! And so we did. Boy were we glad we changed our minds because it was awesome! Simply amazing. That the show is still going all these years later just blows my mind. The new Cash Museum was also great. It's a little small, but the admission price reflects that and if you're a JC fan then you're sure to love it - I know we did. Ventura was a dream and just what we needed after all that heat. It was a really laid back beach town with lots of great vintage and thrift shops, bars and restaurants. We were really keen to check out Ventiki, Ventura's own little tiki bar and decided to stop in for a cold drink and some lunch. We accidentally ended up there all afternoon and into the evening. Our friends from Anaheim Mark & Dyanne, decided to show up and surprise us and they wanted to meet us there. 9 rather strong cocktails later we'd made friends with the bartender and a few other people who we ended up partying well into the night with. Which meant that the next day at the Ventura Nationals we were a bit worse for wear but we had a great time anyway and saw some amazing cars. The next day we even got to go on the Reliability Run up and around the coast and Lake Casitas which was SO pretty! Ventura showed us a really nice time! We spent the next two days at Sunset Beach, right by Huntington Beach along the Pacific Coast Highway. Our aim was to spend a decent amount of time at Don the Beachcombers, seeing as we really only got to pass through quickly last time. This was where we met our friends Mark and Dyanne last year, so not only did they come along back where it all began but we ended up running into a bunch of tiki peeps who we had drinks with in the private room (to avoid the awful karaoke). It was like a little Tiki Oasis reunion, plus we got to meet a bunch of new friends. We checked out Seal Beach, just down the road the next day and enjoyed a relaxing couple of days by the beach. Then we headed to Anaheim (well, Buena Park actually) to stay with our friends Mark and Dyanne for a couple of days at their house. Boy did they show us a good time! They were so kind and took such good care of us and we had so much fun drinking beer in their pool and listening to some great tunes. They also cooked us up so many amazing feasts! We didn't just hang out at home though, they took us to the Elvis Bar in Garden Grove which was amazing! We also visited Mooneyes in Santa Fey Springs which was extremely cool and the perfect warm up to the Mooneyes Christmas Party in Japan in December! Then it was on to our final stop in L.A where we were reunited with our friends Kristy and Justin who we met at Viva last year. These super stylish cats showed us a great time and took us to a bunch of cool old historic places around L.A including Damon's tiki restaurant, The Pantry which has been serving breakfast 24 hours a day since 1923 and does THE BEST bacon (it tastes like pork crackling OMG!!). We also did the tourist thing and visited Venice Beach and the Santa Monica Pier which was another lovely day by the seaside. We went out to a couple of gigs with them too and strangely enough ran into a few people we knew including Brent from the Ding Dong Devils, Deke Dickerson and Eddie Clendening! We just can't go anywhere! Haha We decided we should spend our last night in the US going out with a bang so we went to The Viper Room (yes THE famous Viper Room) and saw The Chop Tops as well as a bunch of other cool psychobilly bands. We stopped in famous Mel's Diner for a middle of the night greasy on the way home too. Our flight back home wasn't until midnight the next day so after nursing a bit of a hangover we headed off to Universal Studios for the day to act like big kids. We had an awesome time! It was the perfect way to see out our very last hours in America. We did this last year as well, so perhaps it will become a tradition. Gosh we had such a brilliant time! It should come as no surprise that we're already planning another trip back. But first, Japan in December. Of course until then it's just back to the grind and what better way to cure the post-holiday blues than with a new 'do! For those of you that may not have seen my post on Facebook, my hair looks like this now! Wild I know, but I love it! Meanwhile, tell me what have you been up to? Have I missed any important news? Well this is it people. The time is here! 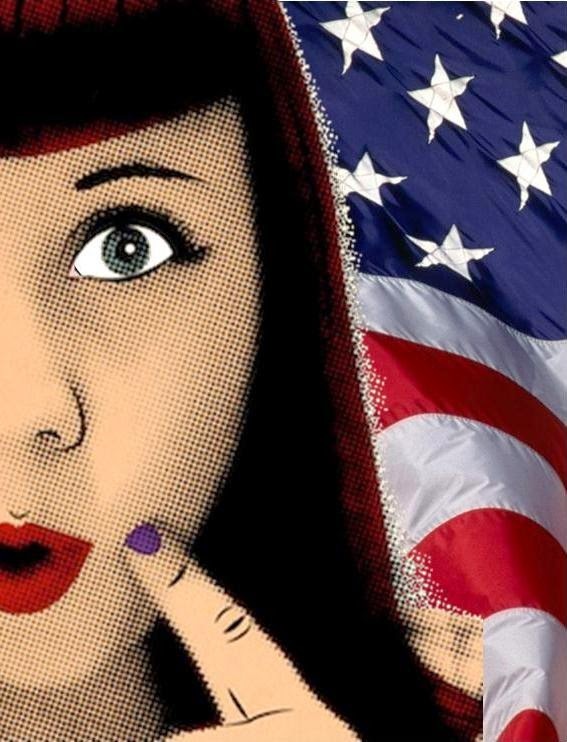 In less than 48 hours I will be up in the air and on my way to the USA and the Road to Tiki Oasis! Unfortunately I seemed to have picked up at bit of a bug at GreazeFest on the weekend and I'm feeling a bit under the weather but I've dosed myself up and have my fingers crossed that I'll be feeling better by Friday morning. Below is a little map of where we'll be visiting while we're in the US for those of you that are curious. Keep an eye on my Instagram account as I will definitely be posting some snaps of our travels along the way as well as on the Facebook page. 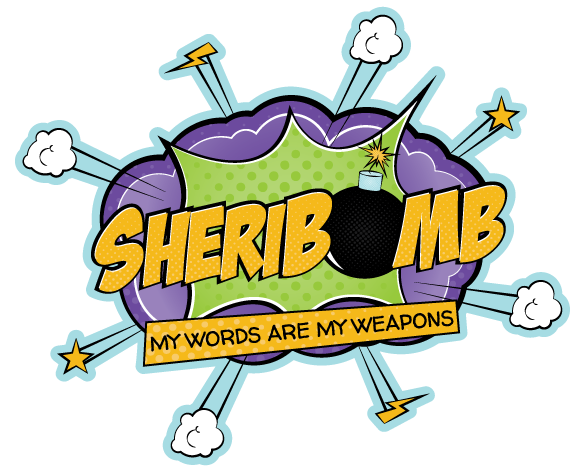 I won't be blogging at all along the way as I plan to be having way too much fun to have time for that, so you'll just have to wait until I get back to hear about all my adventures. Until then, be kind to yourselves and I'll see you in a month! Well it's just 2 weeks until we will be up up and away to the good ole US of A and on the road to Tiki Oasis. The anticipation is building and so are the pretty things in my suitcase thanks to the kindness of all the sponsors we've had on board for this feature series. 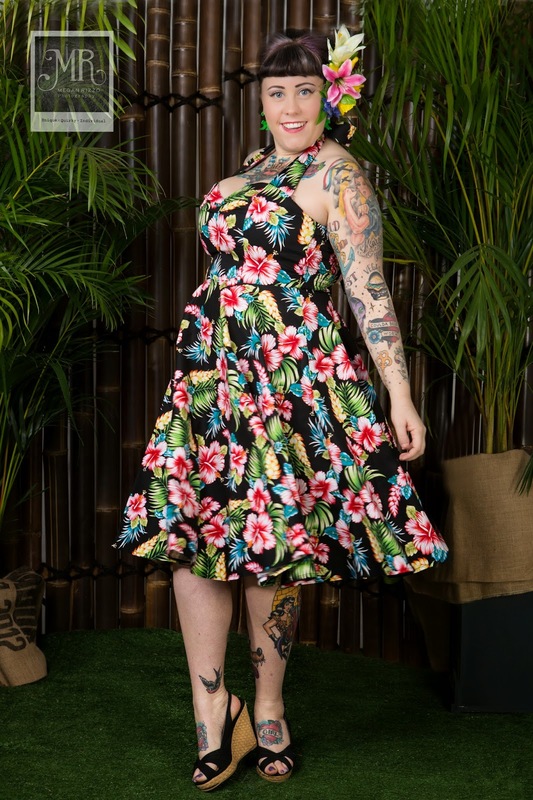 I hope you've enjoyed getting a glimpse into the wild and wonderful world of tiki and the little preview of some of what I'll be wearing poolside at the festival. I know some of you are a bit jealous and to be honest, I can totally understand why. I would be too! So, because I'm not the kind of person who just wants to flaunt this stuff in your face I've decided to do a giveaway! 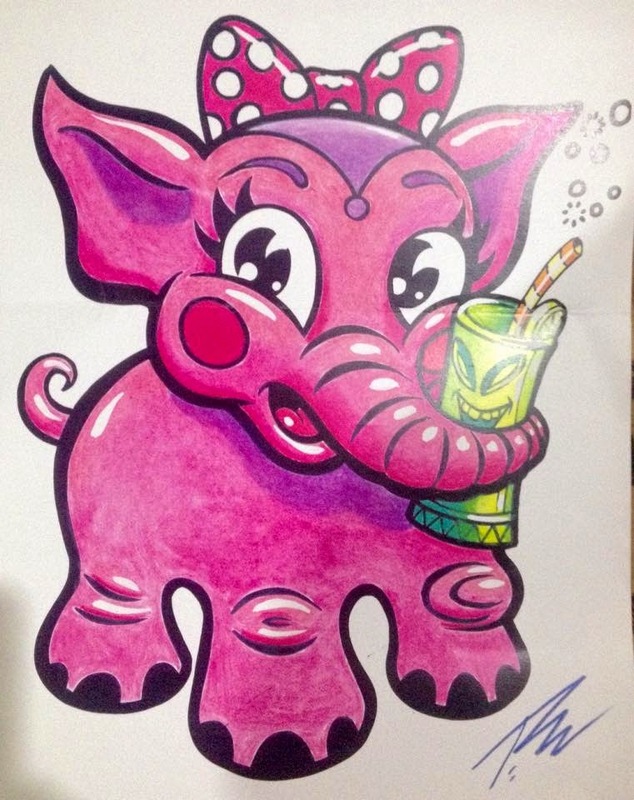 Everything you've seen me feature in the Road to Tiki Oasis series could be YOURS! That's right, even if you're not off to the San Diego tiki weekender you can still enjoy a tutti fruitti good time. With summer right around the corner you'll be set for when the sun starts to shine and the temperature begins to rise! Sounds pretty good to me, even if I do say so myself! But enough of that, I bet you're wondering what you actually get? Well let me tell you, it's a doozy! The lucky winner will receive ALL these fantastic prizes! That's a total prize value of $420!! To enter, simply leave a comment below telling me why you would like to win. Fine Print: Entrants must leave their email address so they can be contacted if they are the winner. Megan Rizzo polaroids to be redeemed at Brisbane GreazeFest only.Entry open to Australian residents only. Winner will be drawn Friday 1 Aug. Winner has 48 hours to respond. If no response is received a new winner will be drawn. Disclaimer: I did not receive any payment for any features in the Road to Tiki Oasis series. Product was provided for editorial consideration. 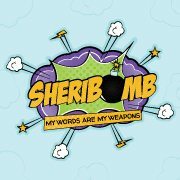 All opinions are my own and are in no way influenced by the sponsor. I did it to showcase some fantastic local talent because I believe in supporting small businesses and artists. Plus I knew you guys would like it anyway. Win win right? Now I don't have to feel guilty about going and spending a bunch of money on businesses and artists overseas. Buy local and support small business, ok? 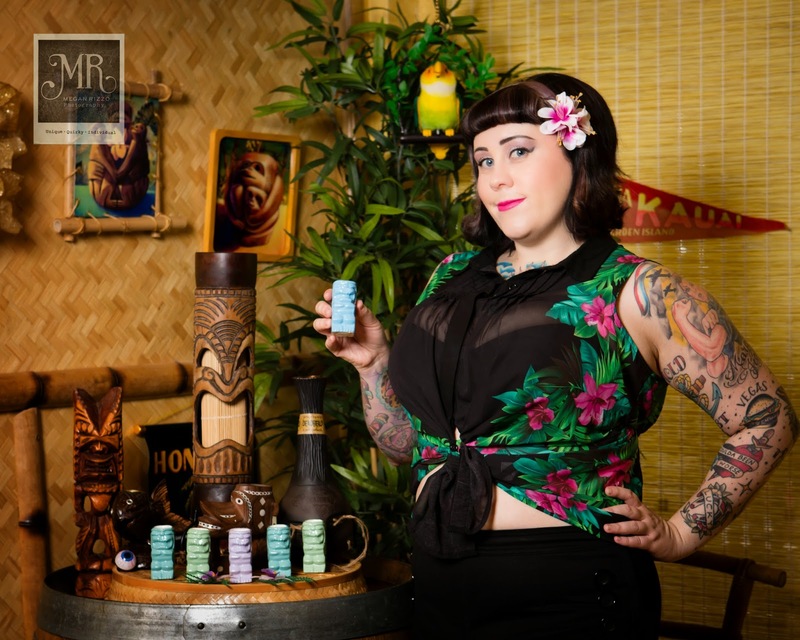 The final instalment of the Road to Tiki Oasis features (or is it? 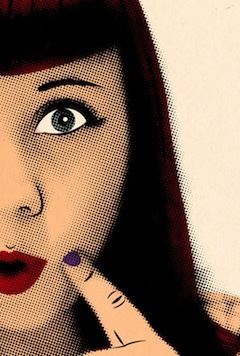 Oooh mystery!) we’re taking a walk on the wild side with Wayne Hoareau of Wild tHing creations. 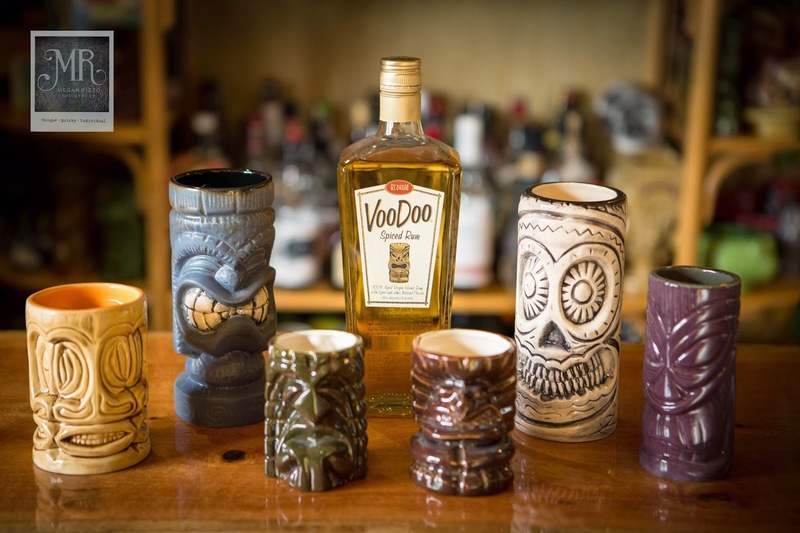 A carver and ceramics artist from the Gold Coast, Wayne creates unique tiki mugs, carvings and wall art, all done with his bent take on the traditional tiki style. 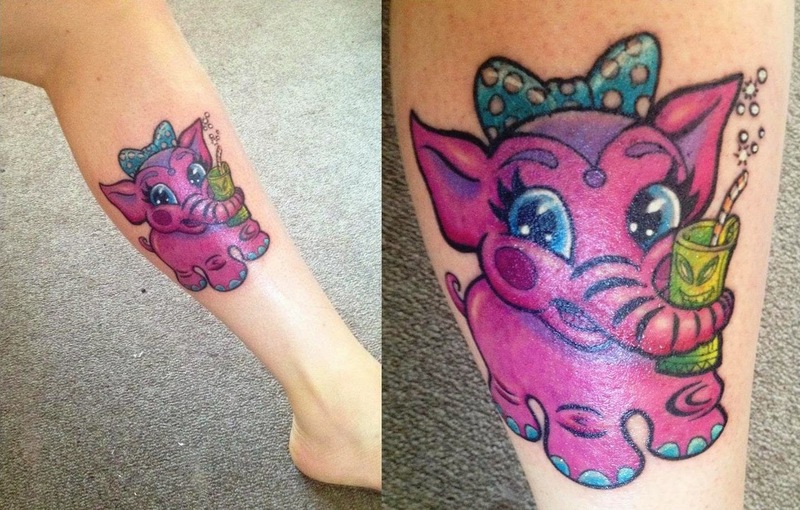 A lover of all things exotic and macabre, Wayne’s freeki art and creepi tiki style is distinctive and truly his own. When he wasn’t accepted into art college, Wayne began working in music retail in 1988 and didn’t stop for almost 20 years. However when he was made redundant from a long term position in 2009, he reassessed his life and decided to try the arts degree angle again. While waiting for a response from the college, Wayne decided to give a carving a go and hasn’t looked back since. He’s now proud to be what the kids from the western suburbs of Brisbane in the 80s always wanted to be. Wild tHing creations was born in August of 2010 with Wayne working out of his house however by April 2011 the operation was booming and he needed to move to a studio and workshop to allow more space for his creations. Unlike most artists, Wayne rarely sketches out his ideas first, rather using the medium he works with to allow the design to emerge. Using the naturally occurring character that each piece of wood possesses, Wayne draws a rough outline and just begins carving. The same can be said of his mugs, which he makes on nothing more than a rough idea and a brief outline, preferring to let his mind control his hands as he sculpts. Moving into mugs has been particularly productive for Wayne with at least three quarters of his time spent making both commission pieces and his own original designs. Taking up a lot of his time, he experiments with clay slip and earthenware. However wax is also involved and is much easier to carve. Of course, there’s nothing he loves more than getting back into a slab of wood and carving when time permits. 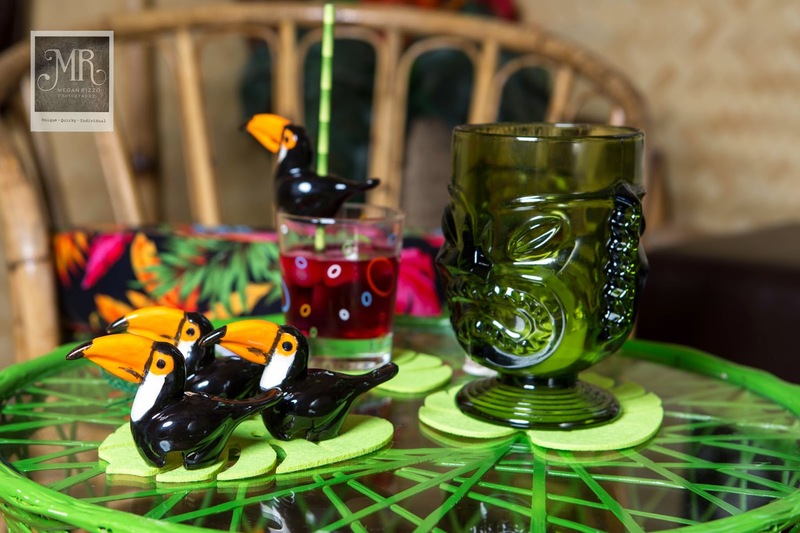 This fine selection of Wild tHing creations’ work includes smaller mugs featuring traditional tiki designs to colourful medium and large sized mugs featuring slightly more cartoon and abstract designs in vibrant colours and Wayne’s trademark freeki tiki style with a large skull-bearing mug created especially for Pepe’s Mexican Restaurant. Each design is unique and is sculpted by hand using a number of carving and sculpting techniques. Each mug is hand glazed both inside and outside and feature a mixture of gloss and matte finishes. 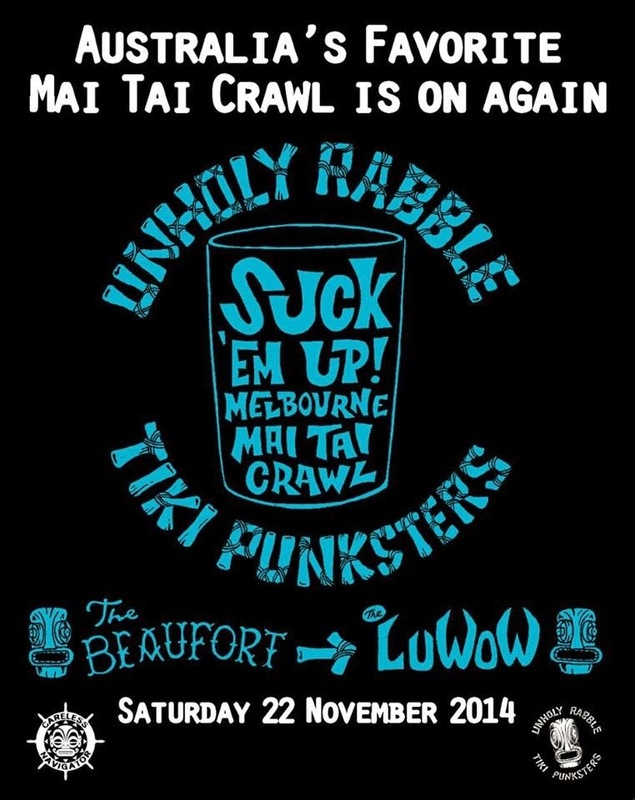 Wild tHing creations can be found at Butter Beats in Southport on the Gold Coast, Feaks Like Us in Nambour, Ruff’n’Ready in Canberra and Two Bit Villains in Adelaide as well as a number of local and independent markets including the upcoming GreazeFest Kustom Kulture Festival in Brisbane. Speaking of GreazeFest, Megan Rizzo Photography will be there too so if you want to be captured in your Sunday best be sure to drop by her photobooth for a tutti frutti polaroid! Megan has been an absolute dream to work with and I am forever indebted to her for capturing such fantastic images to use throughout these features. 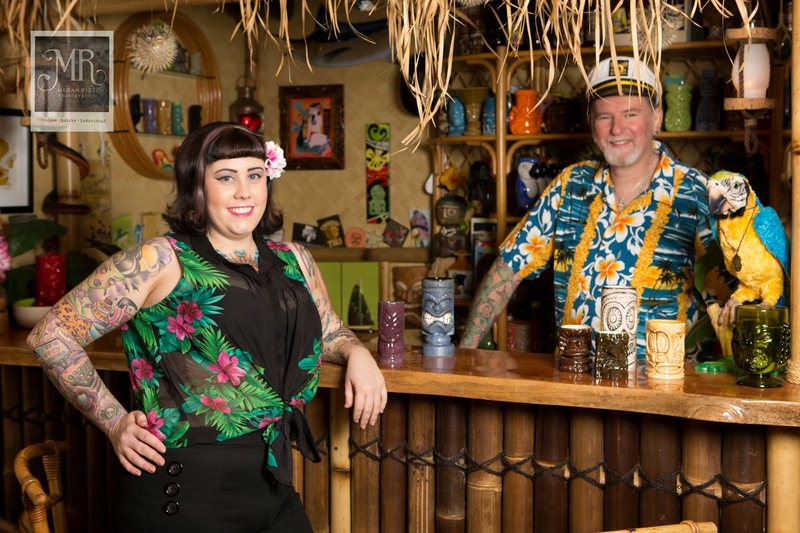 Another big thank you goes to Rod and Maxine for allowing us to shoot on location in their amazing tiki bar, the Soused Seas. 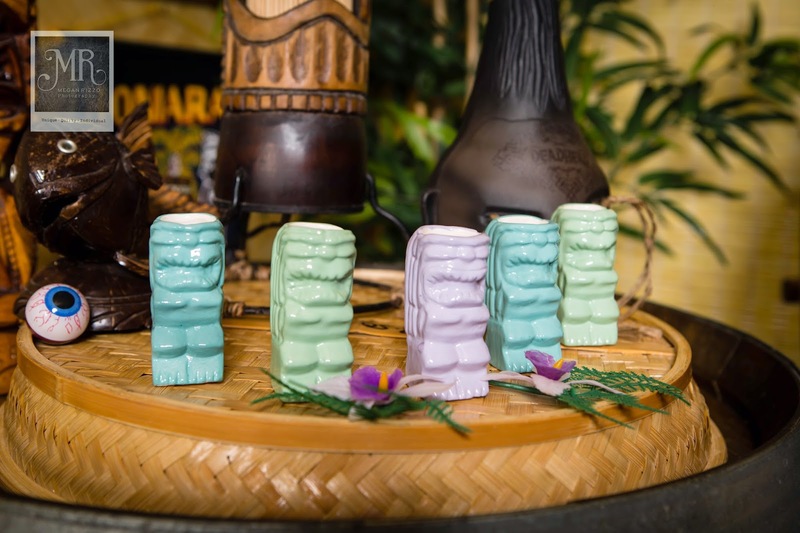 What's the Road to Tiki Oasis without some tiki mugs!? 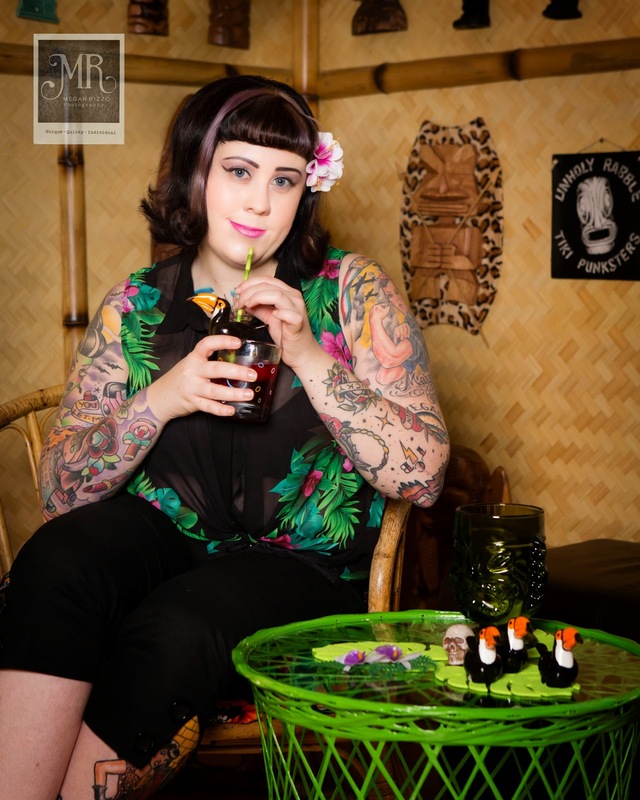 The beauty and brains behind Black Lagoon Designs is my friend Danielle, a tiki-o-phile who completely designs, hand sculpts, fires, glazes then markets and sells the amazing ceramic tiki mugs produced under her label. What began as a hobby, Dani has since turned her passion into a business and it’s been amazing watching her grow and expand her designs and client base. Made from ceramic, the mugs are 100% handmade, durable and hold PLENTY of your favourite drink. Trust me (ouch my head!) Unsurprisingly, Dani's designs are in high demand so her Etsy store is currently sold out but I've heard word from the lady herself that she'll have some pretty new babies restocked soon so be sure to keep your eye out. Until then, join me in drooling over her Facebook page. 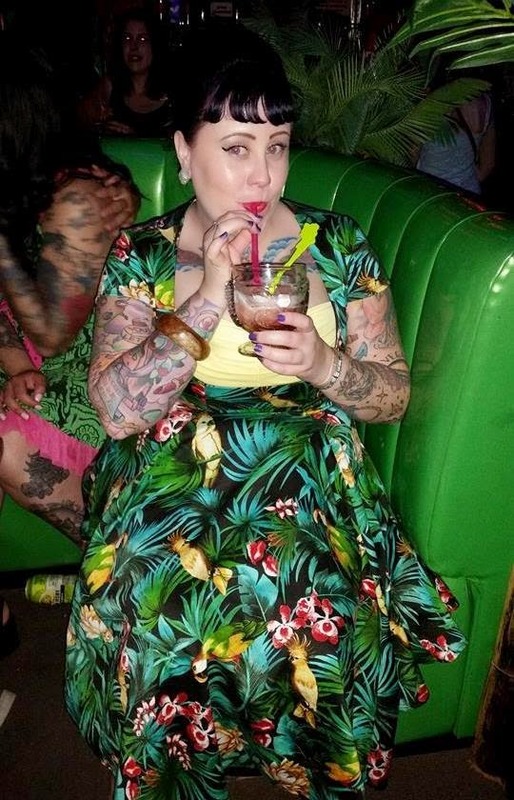 The stuff her crazy brain dreams up is pretty awesome and she also happens to make a mean cocktail to go in her tiki mugs. 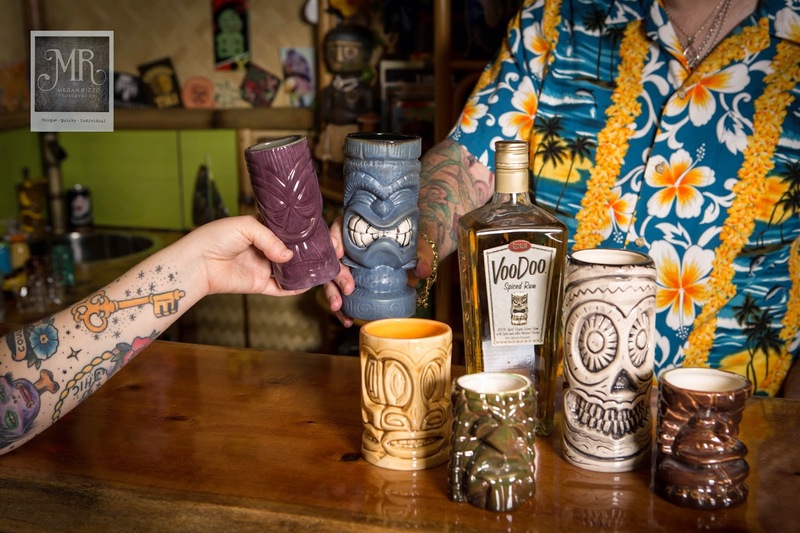 Putting a slightly more feminine spin on the usual tiki mug offerings, the mugs produced by Black Lagoon Designs range in size from these petite pastel shot glasses to the more traditionally-sized tiki mugs capable of holding a bucketful of the best mai tai. Now while I was travelling around the US last year, I collected my fair share of tiki mugs and drooled over plenty more but the designs and stunning glazes that Dani dreams up certainly give them a run for their money. 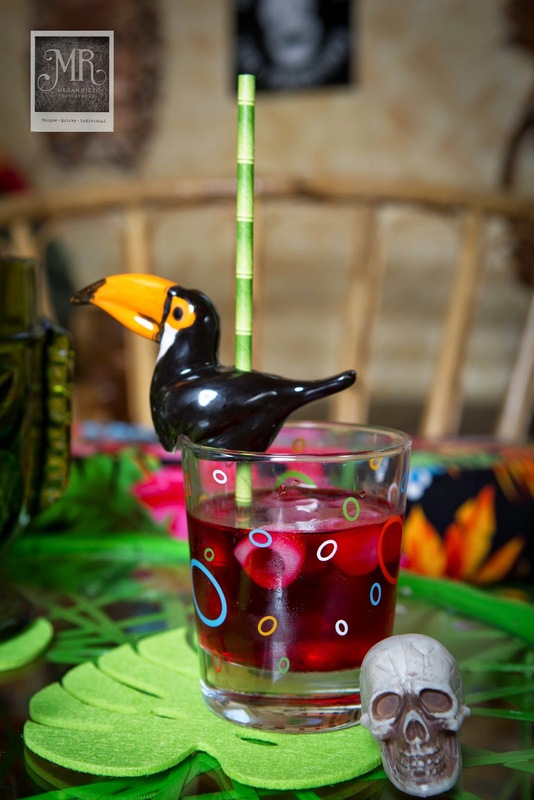 Her designs are beautiful, colourful and inventive and she continues to offer a fresh take on the tiki concept, particularly with newer designs like pink flamingo mugs and these toucan accoutrements. Damn my girl is talented! And speaking of talented friends, could we ever get sick of the eye candy created by Megan Rizzo Photography!? No. The answer is most definitely no! Shot on location at the Soused Seas, it was great fun losing ourselves in this oasis of cool. Thank you to Rod and Maxine for allowing us to come in and make ourselves at home! A big thank you also goes to Megan for once again not only bringing out the best in me but for capturing the details and gorgeous glazes of these mugs in such fine quality. Cheers! As this is now the third instalment of my Road to Tiki Oasis features, no doubt you've been wondering where on earth I got the stunning hair flowers I've been wearing in the last two features. Dastardly ole me didn't include any information on them in either of the last two posts! Well forgive me, but as I'm sure you'll understand, these beauties are just too divine to be tacked on to another post. They deserve a feature all of their own! Hand made by Kat's Cadillac Vintage, these stunning artificial hair flowers come in a variety of colours, shapes and sizes and can even be custom ordered to suit anything you can dream up. 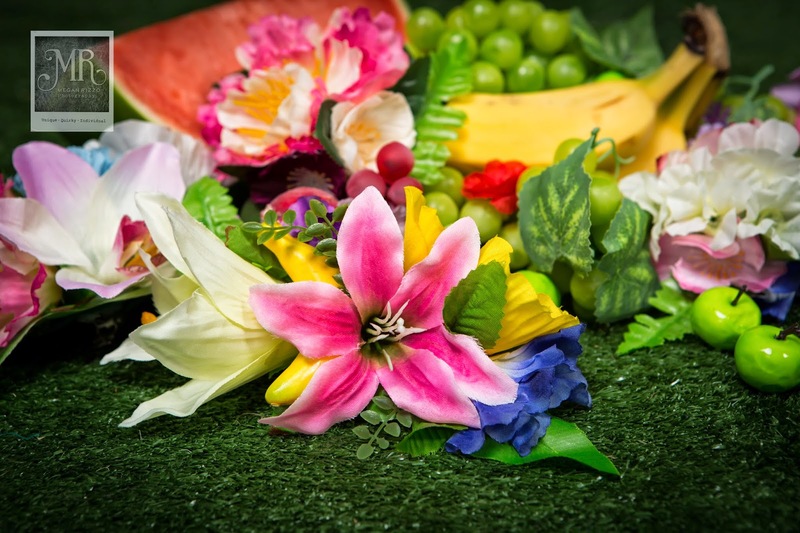 Featuring everything from tropical fruits to a variety of flower species, these beautifully handcrafted flower hair accessories vary from a tropical tiki vibe to pops of sunny spring colour and are the ideal finishing touch to any outfit. Whether you want to add a touch of vintage glamour to your overall look or want to shake things up Carmen Miranda style, there is just so much variety in size and colour to choose from. If you've got a particular outfit in mind, Kat's Cadillac hair flowers can colour match and design a hair piece to contrast or complement your ensemble. Made from durable synthetic flowers that won't crumple or fray, these stunning hair flowers absolutely are the Cadillac of the hair flower world (although sold at closer to 1950s prices than most products of a similar quality on the market). Artfully arranged, the hair flowers come backed by a soft felt and large silver alligator clip that fastens securely to your hair and won't slip or slide out of place but also won't damage or pull on your hair. These versatile clips not only draw an immediate focus for your hair but can also be worn as an eye catching floral statement on clothing and even footwear if you're game. Handmade by my beautiful friend Katrina, these gorgeous hair flowers are designed with an eye for vintage in mind. Having been a dedicated vintage collector for her entire life (she has a whole room in her house filled with amazing vintage treasures and that's not even her personal collection! ), Katrina has a deep knowledge of all things vintage. 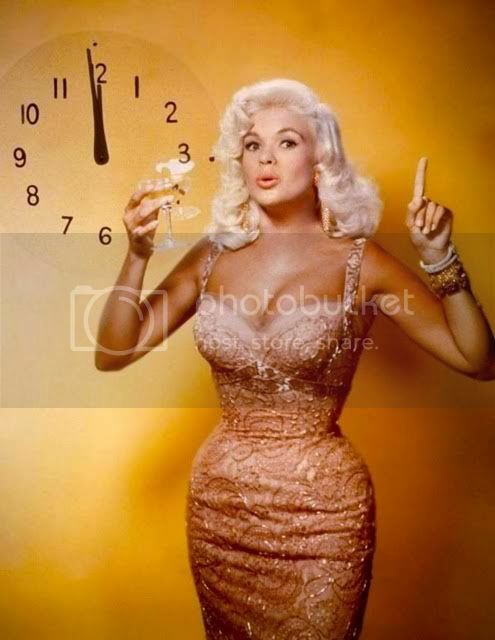 Keep an eye out on the Kat's Cadillac Vintage page for amazing vintage clothing to pair with your hair flowers and strut your stuff as the complete package. As for me, no doubt I'll be talk of Tiki Oasis sporting these spectacular original handcrafted creations and I can't wait to tell everyone that they're Aussie made! Another spectacular handcrafted original that is Aussie made is Megan Rizzo Photography and once again she has managed to capture all the little details that make these hair flowers and therefore these images special. It was so fun getting flowery and fruity with her and she went above and beyond to make these images really pop, including pulling some impressive poses herself to get her lense right into the action. I'll leave you now so you can order up a hair flower storm in peace.